Takehiro Fukuda was drafted to pitch for the Yokohama DeNA Baystars, a pro team, at age 25, and retired five years later in 2013. 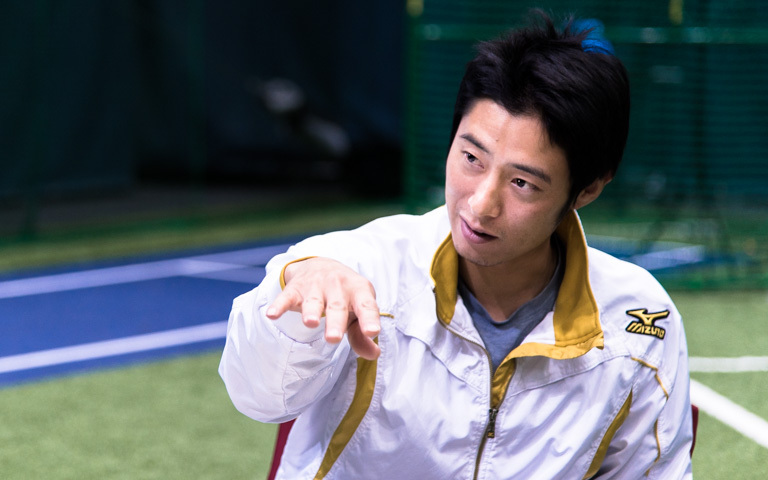 Recently, Fukuda signed on as a research specialist and the latest member of the Sports Brain Science Project in January 2017. With Fukuda's knowledge of sports science acquired at Kyoto University Graduate School—not to mention his invaluable experience as a professional baseball player—this interview will address how Fukuda got started as a researcher, how he became involved with the SBS Project, and how he views the issues addressed by the project as a researcher and as an athlete. —A surge of excitement went through the project when we heard that former pro pitcher Takehiro Fukuda was coming to work with the Sports Brain Science Project in January 2017. Tell us first how you bumped into Dr. Kashino and why you decided to get involved in the SBS Project. Fukuda: My first encounter with Dr. Kashino goes back to 2014 not long after I retired from pro baseball. While I was still working for an accounting firm, I had just taken my graduate school entrance exams. An opportunity opened up when an upper classman in a seminar I was taking (he is now an Assistant Professor at Tokyo University) suggested that I might want to get involved in Professor Kimitaka Nakazawa's lab, since he was conducting some interesting metrics on baseball. Kashino: I met you for the first time in a baseball field, where a measurement of pro players by Nakazawa Lab took place. Masumi Kuwata (former pro pitcher of Yomiuri Giants and Pittsburg Pirates) was also there. In a break, he and I started to play catch. He told me to hold my glove in front of my left chest and not to move it, and the ball always came exactly at the glove. I was amazed at how straight and accurate his pitching was ? just like an arrow. Next, I played catch with you. You, on the other hand, the pitch was rather rough and very fast, and I felt that I would be killed (laughing)! This was the first time I had seen pitches thrown by real pros up close—not to mention, the first time I received pitches thrown by real professional pitchers—and it was very apparent that this was a totally different kind of pitch. Fukuda: I had just retired from professional baseball and engaged in desk work, so I simply wanted to throw the ball. I was really happy and excited to play catch for the first time in a while, and just threw the ball as hard as I could. I thought it was OK because this person was able to catch Kuwata’s ball without problems (laugh). After that, I went on the Nakazawa Lab summer retreat, and there we had a chance to play ball together. About this time, I was starting to think about what I wanted to do in the future, and thanks to these encounters with Professor Nakazawa and Dr. Kashino, the idea took hold that I might investigate sports science as a researcher, while also leveraging my past experience as a pro pitcher. I discussed whether I might join the project with Dr. Kashino, and became an official member in January 2017. Kashino: As the project proceeded, I was acutely aware that we needed a bridge builder, someone could bridge the gap and interpret the languages of the athlete on the one hand and the researcher on the other. There have been plenty of cases in the past of sports science studies failing as a result of barriers due to theoretical or language differences between researchers and athletes. If the relationship doesn't hold some advantage for both sides and the researchers announce unilaterally that they want to conduct some measurement, the athletes may not be inclined to go along. This may be especially true in Japan where there seems to be a gap between researchers and athletes. 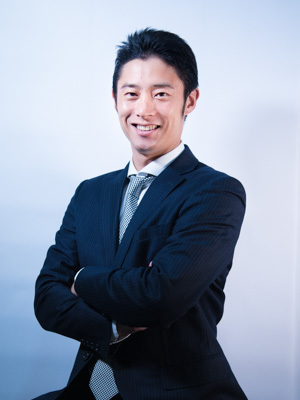 Fukuda is exceptional in having experience in both worlds of athletics and research, and should prove immensely useful at bridging the gap between the two. Fukuda: When Dr. Kashino approached me, I had been thinking about getting involved in a sports business, and had offers from a business site and an invitation to work as a coach for a baseball team. Both were attractive offers, but I really wanted to continue research, and felt that the SBS project closely adhered to the way I saw the issues both as a researcher and as an athlete. So in the end, I decided to go with the project. In fact, before joining the project, I had visited NTT Communication Science Labs (CS Labs) several times as an experiment participant. Kashino: Yes, I have presented data in lectures where I compared different patterns of muscle activity of a former pro pitcher and an amateur sandlot pitcher, and here I would disclose that the former pro in these comparisons was in fact Fukuda. I would further disclose that the amateur in the data was me! —Yes, that's right! So, what did those measurements actually reveal? 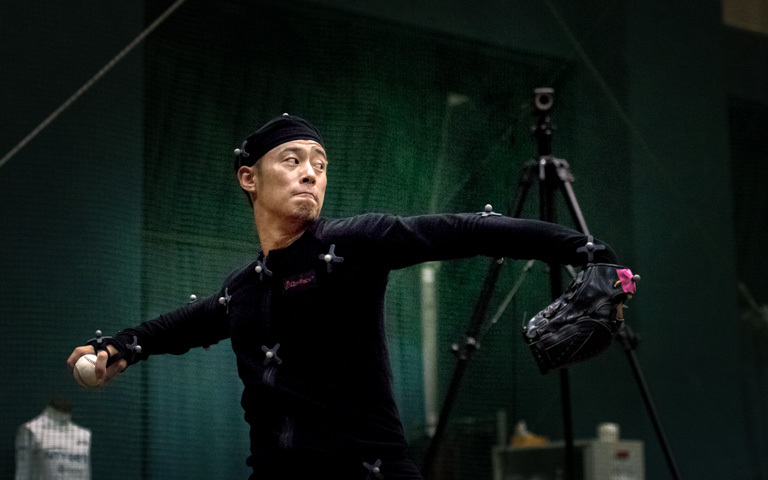 Fukuda: Even while I was still enrolled Kyoto University, I attached some EMG sensors to myself and conducted measurements, but wireless detectors were not yet available so we couldn't measure really strenuous movements like pitching. But then, with the development of wearable sensors like the conducting functional material hitoe, it was suddenly practical to measure pitching data. Kashino: Comparison of my measured pitching results with those of Fukuda was very revealing. A pitch thrown by a pro is so straight, fast and strong, yet to all appearances, the pitcher seems to be completely relaxed. This really separates the pros from the amateurs. And when we measured actual muscle activity, we found that the pro was hardly straining at all. The difference between the pro under stress and the pro relaxed was sharply defined, and we found that the pro tensed up only for a brief moment when the ball was released. But in my case, as the amateur pitcher, it was very different. I tensed up unnecessarily for a prolonged interval before and after the ball release, and it was through these comparative measurements that I first realized how much wasted effort is expended. Furthermore, this difference is not at all apparent from photos, no matter how many pictures you look at. What I remember most vividly from playing catch with Fukuda is his tendency to throw gentle slow pitches. More typically, we practice by throwing as hard as we can, and this is very difficult to sustain. But if you think about it, a person who really knows what they are doing is able to control a situation over a wide range. For example, consider singing or playing an instrument. Performing a sweet melody in pianissimo can be exceedingly difficult, yet the true virtuoso is able to transition with perfect timing from soft pianissimo to loud fortissimo. In much the same way, throwing a gentle slow pitch can be exceedingly difficult. Indeed, this remains a formidable challenge. Fukuda: Absolutely. Throwing gentle slow pitches is tough, yet it's the very best training for learning to relax. When I was a high school student I always practiced by throwing as hard as I could. Then, I played one season with an independent league before I went pro and continued to throw hard fast pitches, but I realized I just didn't have it that season. Finally, around that time, I learned from a coach, a former pro pitcher, that the best practice was to throw slower perfect-form pitches. But to throw good-form slow pitches, you have to be fully conscious of your torso and extend awareness to every corner of your body. If you practice in that way, all faults become readily apparent so you can train yourself by focusing on that particular part of your body. Based on my experience, I passed on the same advice to Dr. Kashino when we played catch: loosen up, relax, and practice throwing deliberately slow pitches. In fact, this sort of relaxation was a key theme of my research when I was at Kyoto University. By the way, I'll let you in on a little trade secret. When pitching, you finally release the ball with your figure tips, but I envision making a basketball-like throw of a Kleenex into the wastebasket (laughs). No matter what form you use in throwing, the key is to relax your wrist and put some velocity on the ball. —Not at all what one would expect—a straight fastball while envisioning such a gentle pitch! —What was the focus of your research in graduate school? Fukuda: At Kyoto University I studied under Professor Shingo Oda, and my work mainly centered around motor control studies. In broad terms, I studied how the body moves—walking, running, and so on; in other words, posture control. I was particularly interested in how the stability or instability of one's pitching posture affects form. One of my seniors in the lab was investigating ball trajectory variations. —What made you decide to go on to graduate school? Fukuda: I have been playing baseball since second grade in elementary school and always dreamed of becoming a professional ballplayer, but I wasn't able to go pro when I was a senior at university. But my love for baseball was not diminished, so I hit on the idea of pursuing sports science at the graduate level as a way of maintaining contact with the sport. Then I came across postural control as a research subject, and pursuing that approach, actually achieved some good body movement results using myself as a research subject. At that time, I belonged to a club team and only played on the weekends, but even so I was amazed at how my coordination and overall game improved thanks to these insights. —Did you have any other special training? Fukuda: The key point was that I completely altered my mindset. First I tried the usual routine of focusing on my posture. And when pitching I focused on just one part of my body. This training method was based on Professor Oda's research on "motor control in bilateral force." Diminished capacity when bilateral force is applied basically means a 10% reduction in grip strength when measuring both hands using a hand dynamometer even for a guy with 60 kg of grip strength for either right or left hand alone. 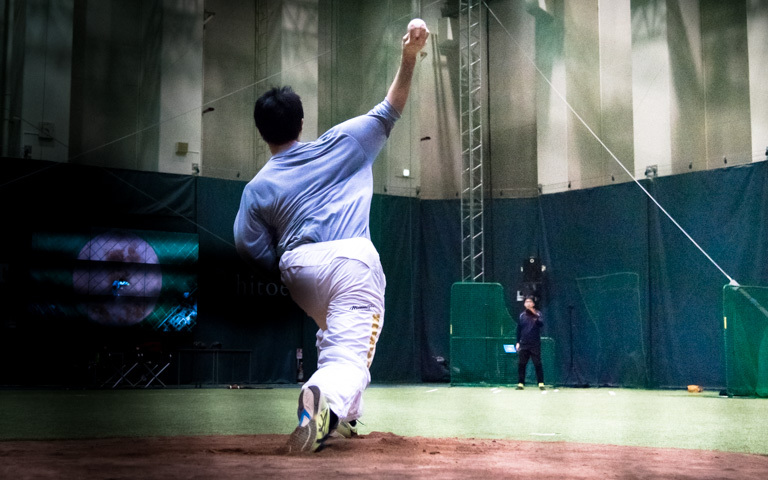 Knowing how to similarly focus awareness when pitching, if you focus effort throughout the whole body you will not be able to reach your full potential, so it's better to shift your coordination to just focus on a single part of the body. Professor Oda calls this approach "releasing awareness," and advocates focusing somewhere other than on your pitching arm, which contrary to what you might expect, actually improves the velocity of your pitch. Until then, I had always tried to give 100% of my strength, but it became apparent that I wasn't succeeding. So by adopting this simple technique of stabilizing my posture and focusing on a single place—for example, focusing awareness on the glove on my left hand while pitching—this eliminated excess power, and my coordination gradually improved. This is very similar to what I was saying earlier about relaxation. I was 22 at the time, but then the independent league coach suggested that "if you can throw like that, you should try out for a professional team," and that prompted my move to the pros. Then I chatted with Professor Oda, and he was also encouraging: "If you succeed as an athlete that's wonderful, but even if you don't, your experience as an independent league player will certainly stand you in good stead as a researcher, so by all means, you should at least try." So I took a leave of absence from graduate school, and immediately tried out for an independent league, and this subsequently paved the way to play on a pro team. —We would like to hear how your mental focus and coordination changed when you turned pro. Kashino: I think the point you made about directing your awareness elsewhere is exceedingly important. In my case, I don't focus on my own body. Rather, I line up on the target of my pitch, and following along with Kuwata's advice, picture myself throwing a big washtub. I too get better results if I focus on something other than my body. And if you do focus on your body, you may get better results by concentrating on someplace other than your elbow or throwing arm that are directly related to delivering the pitch. Previously, a pro pitcher suggested that I can get more power and accuracy in my throw by bouncing up on my tip-toes. I had never given any thought to my toes, but it's true. I found that if you get up on tiptoes, this automatically lowers the ball of the foot, which firmly plants the balls of your feet and heel arches solidly on the ground and gives you a stable base from which to throw. Walking becomes much easier as well. Fukuda: Yes, rather than focusing on the spot you are concerned about, it's important to focus somewhere else. When I was playing pro and tensed up, my field of vision got very narrow so I could only see the batter. So in order to reset my focus, I would stare at some fixed point such as a light in Yokohama stadium just before throwing my pitch. It is very hard to land a satisfactory pitch when your consciousness is focused on your own body and you tense up. This has been one of my basic concerns as a pitcher and a researcher.